With cool weather just around the corner this means that pumpkins, hot chocolate, and chili season is to come. If you’re like me, you are going to be making even more frequent visits to your local coffee shop for that certain beverage that will warm you to your toes. Starbucks has got nothin’ on this! 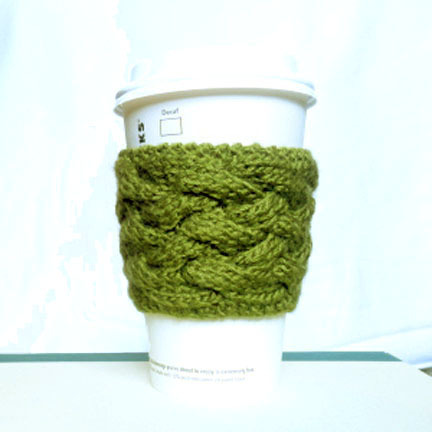 It’s time to be environmentally friendly by knitting yourself a reusable coffee cup sleeve. *Note: There are two ways you can cast on with this pattern. I’ve chosen to use a provisional cast on which leaves one end with live stitches where you can invisibly graft the two ends together at the end. Another option is to do a regular cast on technique and later sew the two ends together. ROW 2 and every alternate row: K2, purl to last 2 sts, K2. ROW 5: K2, *C8B; rep from * to last 2 sts, K2. ROW 11: K6, *C8F; rep from * to last 6 sts, K6. Continue until sleeve reaches approximately 9 inches (23cm). Bind off and sew two ends together or use Kitchener’s Stitch to graft two ends together. If you like this pattern, please Like us on Facebook! Is lovely, I made one of my own in crochet with the only pattern I know, a basic one. Hope you like!! What yarn did you use for your sleeve? For this project I used Caron Country merino wool blend. The color is Loden Forest. I’ve used other medium weight yarn and it looks just as good. Though I don’t recommend yarn that is fuzzy like an alpaca blend. Love this pattern. Might be making one for my husband soon. Also, do you know if anyone has a pattern for a sleeve with a bottom? I have an uneven travel mug and would love to make a sleeve that the mug actually sits in. First of all, that is beautiful. Second, what size cup is that in the photo? I was hoping to make this for a tall sized beverage from Starbucks? Would I need to edit the pattern at all to do so? Please advise! Hi Dana! I’m so glad you like this sleeve pattern. In the picture I used a 16oz or medium/grande size cup. You should not have to edit the pattern for a 12oz or small/tall size. But if you do find that it is too big for a tall size, I would suggest you use a lighter weight yarn. Note: this video is for c6b, c6f but they are done the same way. Thank you for the link, but I think there might be a mistake in the pattern. My sleeve does not have as many cables as your picture does. I’ve cast on 20 sts and followed the pattern exactly. In row 5 I can repeat C8B twice and in row 11 I can C8F only once. In your picture it shows a C8B three times and C8F twice. Am I doing something wrong? You are not doing anything wrong. If you follow the pattern and repeat rows 1-12 a couple of times, you will see the cables begin to take shape and it will look like the pictures shown above. Would you be able to do a video soon of how to graft the two ends together? Unfortunately, I don’t think I will be making a video but if you go to my post Very Berry Scarf, you can watch a video on the Kitchener’s Stitch. http://youtu.be/UYvQzBpReH4. Use this only if you started the pattern with “live” stitches. If you do a regular cast on, then all you would have to do is sew them together. Hope this helps! Working on this now using a worsted weight cotton. It’s knitting up very tight so it won’t be as wide as the one pictured. I’m thinking I’ll go up to size 6 needles for the next one as my stitches seem to be a bit tight and difficult to work with. This basically says: First, knit 2. Now, purl all stitches except the last 2. Then knit the last 2 stitches. In this case, there are 28 sts. Knit 2 leaves 26. You will purl 24 and knit the last 2. You will continue to do this for all even numbered rows. Hope that helps.